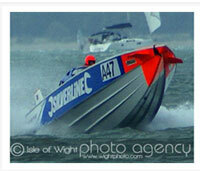 The British Powerboat Racing Club is holding a photo competition for all those who managed to take photos of the Cowes Classic 2012 powerboats last weekend. The annual British Powerboat Festival with over forty brightly painted powerful vessels took part in two main races: Cowes – Torquay – Cowes and the Cowes – Poole – Cowes. The British Powerboat Racing Club would love to add photos to their gallery and to encourage participation Talisker Whisky has kindly provided prizes to be awarded to the owners of the best images. Images will be displayed on the British Powerboat Racing Club website and Facebook page and all images will be credited to their owner. By submitting images participants confirm that they are over 18 years of age, are the copyright owner of the image, that the image was taken in 2012, and agree to the image being displayed on the BPRC website. Deadline for entries is midnight on Saturday 1st September with the winners to be announced on Sunday 2nd September. To enter email a low res copy of your photo with your name and email address to marinemedia@aol.com with Photo Competition as the subject header. Further information about the race including course charts are available on the Cowes Classic www.cowes2012.co.uk website.